"Phyllida Lloyd's famed production of La Bohème has been praised for its perennial freshness, immediacy and close attention to the text. It gives full expression to the joy, wit and frivolity of student life in Paris in the early 1960s, when it is set, but also faces squarely the devastation that death brings when it arrives in the midst of the lives of a group of young friends. Anthony Ward's detailed and atmospheric designs vividly convey the hustle and bustle of the clubs and cafés of Paris. 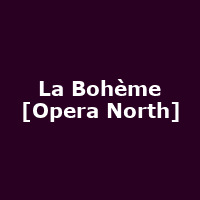 Bohème remains one of the most popular of operas, and rightly so. Puccini weaves a web of glorious melody throughout, and his music speaks directly to the heart of anyone who has ever been young, and loved and lost."